Received March 8, 2018; Revised July 10, 2018; Accepted July 29, 2018.; Published online August 31, 2018. As the most common type of endocrine malignancy, papillary thyroid cancer (PTC) accounts for 85–90% of all thyroid cancers. In this study, we presented the hypothesis that SDC4 gene silencing could effectively attenuate epithelial mesenchymal transition (EMT), and promote cell apoptosis via the Wnt/β-catenin signaling pathway in human PTC cells. Bioinformatics methods were employed to screen the determined differential expression levels of SDC4 in PTC and adjacent normal samples. PTC tissues and adjacent normal tissues were prepared and their respective levels of SDC4 protein positive expression, in addition to the mRNA and protein levels of SDC4, Wnt/β-catenin signaling pathway, EMT and apoptosis related genes were all detected accordingly. Flow cytometry was applied in order to detect cell cycle entry and apoptosis. Finally, analyses of PTC migration and invasion abilities were assessed by using a Transwell assay and scratch test. In PTC tissues, activated Wnt/β-catenin signaling pathway, increased EMT and repressed cell apoptosis were determined. Moreover, the PTC K1 and TPC-1 cell lines exhibiting the highest SDC4 expression were selected for further experiments. In vitro experiments revealed that SDC4 gene silencing could suppress cell migration, invasion and EMT, while acting to promote the apoptosis of PTC cells by inhibiting the activation of the Wnt/β-catenin signaling pathway. Besides, si-β-catenin was observed to inhibit the promotion of PTC cell migration and invasion caused by SDC4 overexpression. Our study revealed that SDC4 gene silencing represses EMT, and enhances cell apoptosis by suppressing the activation of the Wnt/β-catenin signaling pathway in human PTC. As the most common type of thyroid cancer, reports have indicated there to be a progressive increase in the incidence of papillary thyroid carcinoma (PTC) over the past few years in many countries (Cancer Genome Atlas Research network, 2014) (Jung et al., 2014). PTC can be further classified into 2 categories: one is conventional PTC (CPTC) and the other is follicular variant PTC (FVPTC) (Xing et al., 2013). PTC is generally diagnosed based on the characteristic nuclear features, including irregularity of nuclear contours, enlargement, ground glass nuclei, and overlapping (Sheu et al., 2010). Although there several therapeutic methods for PTC exist, such as surgery and radioiodine therapy, all of which are accompanied by a good prognosis, the recurrence rate of differentiated thyroid cancer has reached approximately 30% (Li et al., 2012). In addition, the financial implications associated with the standard treatment of PTC have increased in connection with the ascended incidence of PTC (Brown et al., 2011), thus highlighting the need for further investigations to identify new prevention strategies and therapeutic methods for PTC treatment. Syndecan (SDC), a family of four transmembrane proteoglycans, has been reported to play vital roles in the processes of cell proliferation, migration, and differentiation (Ohkawara et al., 2011). 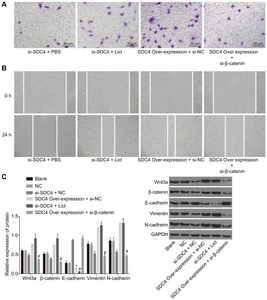 SDC4, is expressed in many different types of cells, including epithelial cells and fibroblasts, and has been reported to exert a significant effect on breast cancer (Okolicsanyi et al., 2015). SDC4, represents an integrin coreceptors of Wnt and has been shown to significantly impact cell adhesion-promoting mitogen-activated protein kinase signaling pathways (Erdem et al., 2014; Ohkawara et al., 2011). Wnts are members of secreted glycoproteins that have been implicated in the development of thyroid cancer (Gilbert-Sirieix et al., 2011; Lu et al., 2016). Studies have indicated that Wnt signals, transduced through disheveled protein, contribute to the accumulation of cytoplasmic β-catenin by negatively modulating glycogen synthase kinase-3β (GSK-3β) (Cho et al., 2011). As the downstream transcriptional activator of Wnt, β-catenin in combination with Wnt establishes the pathway that acts as a central regulator to its downstream genes (Wang et al., 2017). 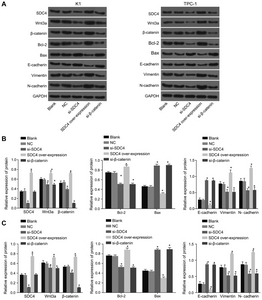 More recently, a greater deal of research attention has been placed on the effects of the Wnt/β-catenin signaling pathway and its influence on cell growth, invasion, metastasis, epithelial mesenchymal transition (EMT), in addition to its activation in various cancers, including colon and gastric cancer (Huang et al., 2014; Yao et al., 2011). Zhang at al. have highlighted the roles of Wnt/β-catenin signaling pathway in PTC (Zhang et al., 2013). Based on the aforementioned exploration of literature, the present study set out to investigate the modulatory effects of SDC4 on the EMT, as well as the apoptosis of human PTC cells through the Wnt/β-catenin signaling pathway. The current study was performed under the approval of the Ethics Committee of the First Affiliated Hospital of Wenzhou Medical University, and was conducted in strict adherence with the Declaration of Helsinki (Hellmann et al., 2014). In regard to the principle of voluntariness, all participating patients as well as their respective families had a good understanding of this study and signed written informed consents. “Papillary thyroid carcinoma” served as the key term used for retrieval in connection with the Gene Expression Omnibus (GEO) database (http://www.ncbi.nlm.nih.gov/geo). The chip data (GSE66783, GSE33630, and GSE3467) and annotated probe files which were obtained by detection means in relation to PTC were then downloaded using the Agilent-060228 Human LncRNA v5 4X180K [Probe Name Version] and Affymetrix Human Genome U133 Plus 2.0 Array. The Affy installation package of R software was used for background correction and normalization processing of each chip data (Fujita et al., 2006). After correction, the p value was considered to be representative of adj.P.Val. A linear model-Empirical Bayes from Limma installation package combined with traditional t-test was then employed to conduct a nonspecific filtration process in relation to the expression data in order to select mRNA with differential PTC expression (Smyth, 2004). The adj.P.Val < 0.01 and |logFoldChange| > 2 served as conditions aiding in the selection process of differentially expressed genes. The Calculate and draw custom Venn diagrams (http://bioinformatics.psb.ugent.be/webtools/Venn/) tool was applied in the calculation of the intersection of 3 chip data comprised of differentially expressed genes. Finally, the gene that was determined to be expressed differentially among the 3 sets of data was subsequently selected. From May 2012 to August 2014, a total of 80 patients with PTC (mean age: 43 years, ranging from 19–74 years) were selected from the First Affiliated Hospital of Wenzhou Medical University for the purposes of the study. Both were PTC tissues as well as adjacent normal tissues. The diagnostic criteria (Xu and Ghossein, 2018) employed were as follows: (1) the majority of the PTC tissue collected was confirmed to have a papillary structure, whose slender branches were above grade III; (2) PTC tissue exhibited heteromorphism at varying degrees, with nuclear ground-glass commonly observed; (3) metastasis occurred primarily as a papillary structure. Based on the World Health Organization (WHO) histological classification and criteria of PTC (Ohori et al., 2017), there were 19 cases with high differentiation, 27 cases with moderate differentiation, 24 with low differentiation, and 10 undifferentiated cases. In regard with the infiltration depth, there were 33 cases in the T1 + T2 stage and 33 cases in the T3 + T4 stage. There were 41 cases with lymph node metastasis, among which, 29 cases were confirmed to have a tumor diameter < 2 cm, and 51 cases with tumor diameter ≥ 2 cm. Patients were enrolled into the study on the basis that they met the following criteria (Francis et al., 2015): (1) thyroidectomy was conducted in accordance with diagnosis and treatment guideline of thyroid nodule and differentiated thyroid carcinoma (DTC); (2) DTC was confirmed using the neck lymph-node dissection; (3) clinical data of patients with PTC was complete. Patients were excluded from the study if they met the following criteria: (1) underwent radiotherapy prior to surgery; (2) received chemotherapy treatment prior to surgery; (3) suffered from mental illness and were unable to communicate. All collected tissues were preserved in liquid nitrogen. The samples were embedded in paraffin, and cut into 4-μm serial sections. After conventional dewaxing, the sections Role of SDC4 Silencing in PTC via Wnt/β-Catenin were then dehydrated by gradient alcohol. The samples were subsequently treated with antigen repair using a microwave, 3% hydrogen peroxide for 10 min, and normal goat serum for 15 min. The sections were incubated with SDC4 rabbit anti-human polyclonal antibody (ab74139, 1 : 50, Abcam, Inc, USA) at 4°C overnight, followed by treatment with biotin-labeled secondary antibody, goat anti-rabbit monoclonal antibody IgG/horseradish peroxidase (HRP) (1 : 2000, ab205718, Abcam, Inc, USA) for 15 min, and streptavidin-peroxidase complex for 15 min. After being developed by 3′-diaminobenzidine (DAB), the sections were then washed with running water in order to terminate the reaction. Next, the samples were stained with hematoxylin, dehydrated, cleared, and mounted. Phosphate buffer saline (PBS) was used in place of the primary antibody and was considered to be the negative control, while the normal mucous membrane was regarded as the positive control. Five high-power fields of vision (× 400) in each section were selected, and a total of 100 cells were counted in each field. The sections were then scored based on their respective percentage of positive cells (Zhong et al., 1999): Positive cells / total cells > 10% was recorded as positive (+), and positive cells / total cells ≤ 10% as negative (−). PTC cell lines (K1, BCPAP, TPC-1, and IHH-4) and normal thyroid cell line Nthy-ori3-1 were purchased from Shanghai Huiying Biotechnology Co., Ltd., (China). All cell lines were cultured in Dulbecco modified eagle medium (DEME, Gibco, USA) containing 10% fetal bovine serum (FBS, Shanghai ML Biotechnology, Co., Ltd., China) and 1% penicillin + streptomycin (100 U/L penicillin and 100 mg/L streptomycin, Gibco, USA) in an incubator with 5% CO2 at 37°C. All cells were passaged once every 2–3 days, while the cells exhibiting logarithmic growth were used in the following experiments. Reverse transcription quantitative polymerase chain reaction (RT-qPCR) was performed in order to determine the SDC4 expression levels among the PTC cell lines (K1, BCPAP, TPC-1, and IHH-4) as well as the normal thyroid cell line Nthy-ori3-1. The 2 PTC cell lines with higher SDC4 expression levels were used in the subsequent experiments. In accordance with the shRNA design principles, the SDC4 and β-catenin coding sequences were searched for in the GenBank. Interference sequences si-SDC4 (GGCAGGAAT CTGATGACTT) and si-β-catenin (CCTGGTCTCTTAGTTCCTT) were designed based on the interference sites of online RNA provided by Invitrogen Inc., USA, and further confirmed as the unique sequence of SDC4 and β-catenin using Blast software in human genome. The endonuclease sites SpeI and HindIII were used to clone the sequences onto multiple clone sites on the downstream of pmirGLO (Promega, USA) luciferase gene. The base sequence of siRNA fragment was then identified. The two selected PTC cell lines were transfected and assigned into the blank (cells without any transfection), negative control (NC) (cells transfected with nonsense negative sequences), SDC4 over-expression (cells transfected with SDC4 over-expression plasmids, Beijing OriGene Biotechnology Co., Ltd., China), si-SDC4 (cells transfected with SDC4 interference plasmids), si-β-catenin (cells transfected with β-catenin interference plasmids), SDC4 over-expression + si-NC (cells transfected with SDC4 over-expression + nonsense negative sequences), SDC4 over-expression + si-β-catenin (cells transfected with SDC4 over-expression + β-catenin interference plasmids), si-SDC4 + PBS (cells transfected with si-SDC4 plasmids + PBS) and si-SDC4 + LiCl (cells transfected with si-SDC4 plasmids + the Wnt signaling pathway activator, LiCl) groups. After being detached with 0.25% pancreatin, both the PTC cell lines were placed in Dulbecco’s Modified Eagle Medium (DMEM) containing 10% FBS, respectively, for re-suspension purposes. The cells were then seeded into 6-well plates at a density of 5 × 105 cells/ml. In the event the cells had grown to 80%, they were subsequently transfected. The 200 μl serum-free Opti-MEM (Gibco, USA) was used to dilute 6 μl lipofectamine 2000 (11668-027, Invitrogen Inc., USA), mixed together and incubated at room temperature for 10 min. Then, 100 μl serum-free Opti-MEM (Gibco, USA) was used to dilute 2 μg target plasmids, mixed together and incubated at room temperature for 10 min. Next, the two aforementioned were mixed evenly and incubated at room temperature for 20 min. After removal of the original culture solution, 180 μl Opti-MEM was added into each well, while the transfected complexes were added into the corresponding culture well. Following incubation in 5% CO2 at 37°C for 6 h, the cells were further cultured in DMEM complete medium. After 48 h, the cells were collected for following experiments. Total RNA was extracted from the tissue and cell samples using Trizol (16096020, Invitrogen Inc., USA). The total RNA (5 μg) was used for reverse transcription reaction into cDNA in accordance with the manufacturer’s instructions of RT-qPCR reagent kit (ABI Company, USA). The target genes were amplified using PCR with a system of 25 μl: cDNA (300 ng), 1 × PCR buffer solution, deoxyribonucleotide triphosphates (dNTPs) (200 μmol/L), forward primer (80 pmol/L), reverse primer (80 pmol/L), and Taq enzyme (0.5 U, S10118, Shanghai Yuanye Biotechnology Co., Ltd., Shanghai, China). PCR was carried out under following conditions, including 30 cycles of pre-denaturation at 94°C for 5 min, denaturation at 94°C for 30 s, annealing at 54.5°C for 30 s, and extension at 72°C for 30 s, followed by a final cycle of extension at 72°C for 10 min, and preservation at 4°C. The primer sequences of SDC4, Wnt3a, β-catenin, B-cell lymphoma-2 (Bcl-2), Bcl-2 Associated X (Bax), E-cadherin, Vimentin, N-cadherin and axis inhibition protein 2 (Axin2) are illustrated in Table 1. β-actin was regarded as the internal reference. The 2−ΔΔCt method was employed in order to present the ratio of expression of the target genes between the experimental and control groups. The formula applied was as follows: ΔΔCT = ΔCt experimental group − ΔCt control group, ΔCt = Ct target gene − Ct β-actin. Ct referred to the number of amplified cycles when the real time fluorescence intensity of reaction reached the set threshold, and the amplification was in the logarithmic growth at that time. The experiment was conRole of SDC4 Silencing in PTC via Wnt/β-Catenin ducted 3 times. The total protein of the tissues was extracted using a radio immunoprecipitation assay (RIPA) reagent kit (R0010, Beijing Solarbio Science & Technology Co., Ltd., China). The protein concentration of each sample was determined using a bicinchoninic acid (BCA) kit (20201ES76, Yeasen Company, China) and was required to be identical in each sample. The amount of protein was adjusted to 20 μg in each lane. The samples were treated with polyacrylamide gel electrophoresis (PAGE) over a 2 h period with separation gel (10%) at 120 V and concentration gel (5%) at 60 V. Next, the samples were transferred onto a nitrocellulose membrane. The filter paper/gel/membrane/filter paper was placed in electrophoresis equipment with electrophoretic voltage of 30 V for 2 h. The gel was placed on the cathodic side, and nitrocellulose membrane on the anodic side. The membrane was subsequently blocked in 5% bovine serum albumin (BSA) for 2 h, and washed 3 times (5 min per wash). The membrane was then incubated with primary antibodies, including SDC4 (1 : 1000, ab104568), Wnt3a (1 : 1000, ab28472), β-catenin (1: 4000, ab6302), Bcl-2 (1 : 1000, ab32124), Bax primary antibody (1 : 1000, ab53154), E-cadherin (1 : 10000, ab40772), Vimentin (1 : 1000, ab45939), N-cadherin (1 :1000, ab18203), and glyceraldehyde-3-phosphate dehydrogenase (GAPDH) (1 : 500, ab8245) at 4°C overnight. Following membrane washing, the goat antirabbit IgG/HRP antibody (1 : 4000, ab205718) was added and incubated with the membrane at 37°C for 4 h. All the aforementioned antibodies were purchased from Abcam Inc., (USA). The tris-buffered saline tween (TBST) on the membrane was extracted using filter paper, and the sample was placed on the clean glass plate. Equal volumes of solution A and solution B from the enhanced chemiluminescence (ECL) reagent kit (BB-3501, Ameshame, UK) were mixed under dark conditions. The mixture was then added onto the membrane, and placed on the gel imaging instrument (E-Gel, Thermo Fisher Scientific, USA) for exposure and imaging purposes. The images were treated by the Bio-Rad image analysis system (Bio-Rad, Inc., USA), and analyzed by Quantity One v4.6.2 software (Bio-Rad, Inc., USA). The grey value ratio of the target protein band to the internal reference band (GAPDH) was considered to be reflective of the relative protein expression. The experiment was conducted 3 times. Propidium iodide (PI) single staining was applied in order to detect cell cycle distribution. After the density had grown to 80%, the cells were washed twice with PBS. After detached with 0.25% pancreatin, the cells constructed into a single cell suspension. Next, 70% frozen ethanol was added for fixation, followed by incubation at 4°C overnight. After the cells had been centrifuged (800 g) at 4°C, the supernatant was removed accordingly. The cells were then washed twice with PBS containing 1% FBS, followed by re-suspension with buffer solution (400 μl), and addition of RNase (50 μl, Sigma-Aldrich Chemical Company, USA) for incubation at 37°C for a period of 30 min. Under dark conditions, 50 μl PI (50 mg/L, Sigma-Aldrich Chemical Company, USA) was added for culturing purposes with extra care taken to prevent light exposure at room temperature for 30 min. Flow cytometry was then employed for cell cycle distribution detection purposes. Annexin-V-FITC double staining was performed to detect cell apoptosis. After 48-h of transfection, the cells were detached using ethylenediaminetetraacetic acid (EDTA)-free pancreatin and collected into a flow tube. Following centrifugation at 1000 r/min for 5 min, the supernatant was removed. After 3 washes with cool PBS, the cells were centrifuged again with the supernatant removed. In accordance with the instructions of the Annexin-V-FITC Cell Apoptosis Assay Kit (Sigma-Aldrich Chemical Company, USA), binding buffer (150 μl) and Annexin-V-fluorescein isothiocyanate (FITC) (5 μl) were added into each tube, evenly oscillated, and incubated at room temperature for 15 min under conditions void of light. Subsequently, binding buffer (100 μl) and PI (5 μl, Sigma-Aldrich Chemical Company, USA) dye liquor were also added, and oscillated in an even manner. The apoptotic cells included apoptotic cells in the early and advanced stage. The experiment was repeated 3 times. Cells in the logarithmic growth were collected, detached, passaged and then seeded into 6-well plates. Cells were then subjected to varying forms of treatment according to their respective groups. At 0 h, the medium was removed. Next, a pipette tip (200 μl) was used to scratch the cells. Serum-free medium was then added to wash the cell surface twice. After cell debris removal, the cells were incubated with the serum-free medium for an additional 48 h. An inverted microscope (× 200) was used to take pictures and record the results, while the scratch distance in each group was determined. The experiment was repeated 3 times. The well-packaged Transwell chamber was added to the 24-well plates. The culture medium (750 μl) containing 10% FBS was then added into the lower chamber. After a 48 h culture period, the cells were collected and diluted using a serum-free medium, followed tallying of the cells. Next, the cells were seeded into the upper chamber (5 × 104 cells/well), and incubated under conditions with saturated humidity and 5% CO2 at 37°C over a 24 h period. The Transwell chambers were subsequently removed, and both the upper and lower chambers were then washed with PBS respectively. The cells on the upper layer of the microporous membrane were wiped off using cotton buds, followed by fixation in paraformaldehyde for 20 min. Hematoxylin was applied to the sample for 3 min, which was then washed with distilled water. The cells that were observed to have migrated to the lower layer of microporous membrane were counted under the guidance of an inverted microscope (× 200). Five fields in each sample were randomly selected in order to record the number of cells and calculate the mean value. The experiment was repeated 3 times. All experimental data were analyzed using SPSS 21.0 software (IBM Corp., USA). Comparisons between adjacent normal tissues and PTC tissues were conducted using a paired t-test. Comparisons between two groups were performed using an independent-sample t-test. Comparisons among multiple groups were assessed by one-way analysis of variance (ANOVA). Enumeration data were expressed as percentage, and analyzed by chi-square test. A value of p < 0.05 was indicative of statistical significance. A selection process was initially conducted regarding the genes with differential expression in PTC, and the detailed information of the PTC profiles is shown in Supplementary Table 1. There were 5, 9 and 49 cases of PTC tissues included in PTC chip GSE66783, GSE3467 and GSE33630, respectively. According to the criteria, adj.P.Val < 0.01 and |logFoldChange| > 2, the differentially expressed genes that were highly expressed in PTC but poorly expressed in normal thyroid tissues were selected from 3 profiles. Following analyses on the initial 30 significantly differential expressed genes, there were 3 genes found in the intersection, protein S (PROS1), SDC4, and leucine-rich repeat kinase 2 (LRRK2) (Fig. 1A). Several previous studies have previously demonstrated that PROS1 (Chung et al., 2012) and LRRK2 (Looyenga et al., 2011) are associated with PTC, while the correlation between SDC4 and PTC has yet to be fully identified. Moreover, SDC4 expression levels among the PTC tissues were higher than that in the normal thyroid tissues (Fig. 1B). The results indicated that SDC4 expression level was highly up-regulated in PTC tissues. Immunohistochemistry methods were performed in order to measure the positive rate of SDC4 protein expression among the PTC and adjacent normal tissues. SDC4 protein was found to be predominantly distributed in the tumor cytoplasm, represented by a brown color. The positive rate of SDC4 protein expression in PTC and adjacent normal tissues was 78.75% and 36.25%, respectively. The results of the chi-square test revealed that the positive rate of SDC4 protein expression in PTC tissues was higher than that in the adjacent normal tissues (Fig. 2). The results suggested that SDC4 was up-regulated in the PTC tissues. The correlations between the positive expression of the SDC4 protein and the clinicopathological characteristics were investigated. As illustrated in Table 2, SDC4 positive expression was found to be correlated with tumor node metastases (TNM) classification, lymph node metastasis, myometrial infiltration, and differentiation (all p < 0.05), while no such association with age or gender was detected (both p > 0.05). Patients at stage III–IV exhibited a higher positive rate of SDC4 protein expression than patients at stage I–II (p = 0.010). The patients with lymph node metastasis also displayed a higher positive rate of SDC4 protein expression when compared with patients without lymph node metastasis (p = 0.001). Likewise, patients with T3–T4 myometrial infiltration displayed a higher positive rate of SDC4 protein expression when compared to patients with T1–T2 myometrial infiltration (p = 0.001). RT-qPCR and western blot analysis methods were adopted to measure the expression levels of SDC4, Wnt3a, β-catenin, Bcl-2, Bax, E-cadherin, Vimentin, and N-cadherin in PTC tissues and adjacent normal tissues. As depicted in Fig. 3, compared with the adjacent normal tissues, PTC tissues displayed significantly elevated expression levels of SDC4, Wnt3a, β-catenin, Bcl-2, Vimentin, and N-cadherin (all p < 0.05), however distinctly reduced expression levels of Bax and E-cadherin were observed (all p < 0.05). The results obtained demonstrated that increased SDC4 expression, activation of Wnt/β-catenin signaling pathway, enhanced EMT and suppressed cell apoptosis were features identified in PTC tissues. RT-qPCR was adopted to determine the SDC4 mRNA level in each cell line in order to select the most qualified cell line for further experiments. As shown in Fig. 4A, SDC4 mRNA levels in the K1, BCPAP, TPC-1, and IHH-4 cell lines were all higher than that in the normal thyroid cells (all p < 0.05). Compared with the BCPAP and IHH-4 cell lines, the K1 and TPC-1 cell lines displayed significantly increased SDC4 mRNA levels (all p < 0.05). The findings indicated that the K1 and TPC-1 cell lines exhibited the highest SDC4 levels and as a result, were selected for subsequent experiments. RT-qPCR was again employed in order to determine the mRNA levels of SDC4, Wnt3a, β-catenin, Bcl-2, Bax, E-cadherin, Vimentin, N-cadherin and Axin2 in the K1 and TPC-1 cell lines. As shown in Fig. 4B, the changing trends of mRNA levels of each gene in the K1 and TPC-1 cell lines were identical. There was no significant difference detected in relation to the mRNA levels of SDC4, Wnt3a, β-catenin, Bcl-2, Bax, E-cadherin, Vimentin, N-cadherin and Axin2 in the K1 and TPC-1 cell lines between the NC and blank groups (all p > 0.05). Compared with the blank group, the mRNA levels of Wnt3a, β-catenin, anti-apoptotic factor Bcl-2, and EMT related factors Vimentin and N-cadherin along with Axin2 were observed to have markedly decreased, while the mRNA levels of the pro-apoptotic factor Bax and calcium adhesion protein E-cadherin were both significantly increased in the si-SDC4, and si-β-catenin groups (all p < 0.05). The results in the SDC4 over-expression group were determined to be opposite to the findings in the si-SDC4 group. The mRNA levels of Wnt3a, β-catenin, anti-apoptotic factor Bcl-2, and EMT related factors Vimentin and N-cadherin along with Axin2 were markedly increased, while the mRNA levels of the pro-apoptotic factor Bax and calcium adhesion protein E-cadherin were all significantly decreased (all p < 0.05). The findings demonstrated that SDC4 gene silencing could inhibit the activation of the Wnt/β-catenin signaling pathway and EMT, while acting to promote apoptosis in both the K1 and TPC-1 cells. Western blot analysis was applied in order to determine the protein levels of SDC4, Wnt3a, β-catenin, Bcl-2, Bax, E-cadherin, Vimentin, and N-cadherin in the K1 and TPC-1 cell lines for further verification. As shown in Fig. 5, the alternation trends of protein levels of each gene in K1 and TPC-1 cell lines were the same. There was no significant difference in the protein levels of SDC4, Wnt3a, β-catenin, Bcl-2, Bax, E-cadherin, Vimentin, and N-cadherin in the K1 and TPC-1 cell lines between the NC and blank groups (all p > 0.05). Compared with the blank group, the protein levels of Wnt3a, β-catenin, anti-apoptotic factor Bcl-2, and EMT related factors Vimentin and N-cadherin distinctly decreased, while the protein levels of the pro-apoptotic factor Bax and calcium adhesion protein E-cadherin were significantly increased in the si-SDC4, and si-β-catenin groups (all p < 0.05). The results in the SDC4 over-expression group were opposite to the results observed from the si-SDC4 group, the protein levels of Wnt3a, β-catenin, anti-apoptotic factor Bcl-2, and EMT related factors Vimentin and N-cadherin were significantly elevated, while the protein levels of pro-apoptotic factor Bax and calcium adhesion protein E-cadherin significantly decreased (all p < 0.05). The findings provided verification of the inhibitory effects of SDC4 gene silencing on the activation of Wnt/β-catenin signaling pathway and EMT in addition to exhibiting its contributory properties in relation to the apoptosis of K1 and TPC-1 cells. Flow cytometry was performed in order to detect the PTC cell cycle entry. As illustrated in Fig. 6, the trends observed regarding the cell cycle entry and apoptosis in both the K1 and TPC-1 cell lines were identical. There was no significant difference observed in regard to the PTC cell cycle entry between the NC and blank groups (p > 0.05). Compared with the blank group, proportion of cells at the G1 phase was increased while decreased numbers were detected in the S phase, suggesting that the apoptotic rate was elevated in the si-SDC4, and si-β-catenin groups (all p < 0.05). The SDC4 over-expression group had fewer cells arrested at the G1 phase, while a greater number of cells were arrested at the S phase, suggesting that the apoptotic rate reduced (p < 0.05). The results indicated that SDC4 gene silencing could influence cell cycle entry resulting in the arrest of cells at the G1 phase, while acting to promote cell apoptosis in the PTC cells via inactivation of the Wnt/β-catenin signaling pathway. Transwell assay and scratch test were applied respectively in order to detect cell migration and invasion in PTC. As depicted in Fig. 7, the cell migration and invasion trends of the K1 and TPC-1 cell lines were the same. There were no significant differences detected in regard to cell migration and invasion between the NC and blank groups (both p > 0.05). Compared with the blank group, cell migration and invasion were inhibited in the si-SDC4, and si-β-catenin groups, however a more significant inhibitory effect was detected in the si-β-catenin + si-SDC4 group, while the SDC4 overexpression group displayed increased migration and invasion abilities (all p < 0.05). The findings demonstrated that SDC4 gene silencing suppressed PTC cell migration and invasion. The K1 cell line was treated with silenced SDC4, as well as the Wnt signaling pathway activator LiCl or over-expressed SDC4 and the Wnt signaling pathway inhibitor si-β-catenin for observation on cell migration and invasion afterwards. The results demonstrated that si-SDC4 could inhibit the migration and invasion abilities of PTC cells. Following the addition of LiCl, compared with PBS, cell migration and invasion were restored. SDC4 over-expression was also observed to markedly promote cell migration and invasion. After si-β-catenin treatment, in comparison with si-NC, cell migration and invasion were obviously suppressed (Figs. 8A and 8B). Western blot analysis was then performed in order to determine the expression levels of the Wnt/β-catenin signaling pathway and EMT related factors in K1 cells that had been subjected to varying interferences. The results revealed that silencing SDC4 could result in the down-regulation of the Wnt/β-catenin signaling pathway related factors (Wnt3a and β-catenin) and EMT-related factors (Vimentin and N-cadherin) while acting to up-regulate the calcium adhesion protein, E-cadherin, through which cell migration and invasion were significantly suppressed. The results of rescue experiments revealed that following the addition of LiCl, the protein levels of the Wnt/β-catenin signaling pathway related factors (Wnt3a and β-catenin) were increased (Fig. 8C). Taken together, these findings provided verification that silencing SDC4 could inhibit the expression of the Wnt/β-catenin signaling pathway related proteins to inactivate the Wnt/β-catenin pathway and further inhibit EMT, which was conducive to the objective of PTC cell migration and invasion prevention. As the most common endocrine malignancy, the increasing incidence of PTC represents the primary cause of thyroid cancer (Xing et al., 2013). Hence, the identification of an optimal treatment strategy has become a top priority in battle against the disease. In recent years, evidence has been presented indicating the potential of SDC4 as a target for breast cancer treatment (Okolicsanyi et al., 2015). However, a scarce amount of literature and investigations into the effects of SDC4 on PTC currently exist. During the present study, we asserted that SDC4 gene silencing could attenuate PTC cell EMT, while promoting apoptosis through suppression of the Wnt/β-catenin signaling pathway. The initial significant finding of the present study revealed that SDC4 expression level was highly up-regulated in PTC tissues, which suggested that down-regulation of SDC4 could potentially ameliorate PTC. Reports have suggested that SDC4 serves as a critical adhesion molecule that is widely expressed but usually down-regulated in normal tissues (Lendorf et al., 2011). As another member of the SDC family, SDC1 has been proven to be up-regulated in breast cancer (Nikolova et al., 2009). Toba-Ichihashi et al. (2016) identified over-expressed SDC4 in hepatocellular carcinoma and malignant mesothelioma. All of these findings led us to believe that SDC4 knockdown could be a therapeutic method for PTC. The data obtained implied that the expression levels of Wnt3a and β-catenin increased in the PTC tissues, which ultimately indicated that activation of Wnt/β-catenin signaling pathway aggravates PTC. Wnt3a is widely considered to be an initiator of the Wnt/β-catenin pathway (Lee et al., 2014). Wnt overexpression can enhance β-catenin, which is a critical mediator of the Wnt pathway, via elevation of phosphate GSK3β (Liu et al., 2018). A prior study highlighted the importance of β-catenin on tumorigenesis (Zhang et al., 2013). Cho et al. (2013) reported that Wnt/β-catenin signaling exerts significant impacts on tumorigenesis of human PTC. Furthermore, Wnt/β-catenin signaling pathway has been observed to be activated in PTC (Zhang et al., 2012), which is consistent with the finding of our study. In addition, our results demonstrated that SDC4 gene silencing decreased the expression levels of Wnt3a and β-catenin, which indicated that SDC4 gene silencing could suppress activation of the Wnt/β-catenin signaling pathway. Studies have shown that SDC4 serves as a regulator of canonical and non-canonical Wnt pathways (Astudillo and Larrain, 2014). Astudillo et al. (2014) provided evidence suggesting that SDC4 inhibits the activation of the Wnt/β-catenin signaling pathway by regulating the low-density-lipoprotein receptor-related protein (LRP6) and R-spondin 3, which was also in parallel with the findings of our study. 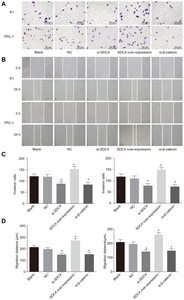 Finally, during our study, we were able to demonstrate that SDC4 gene silencing reduced the mRNA and protein levels of Bcl-2, Vimentin, and N-cadherin but elevated expression levels of Bax and E-cadherin, which suggested that SDC4 down-regulation suppressed PTC cell migration and invasion, while enhancing the process of apoptosis. As a crucial marker of EMT, Vimentin is an indispensable factor in the regulation of mesenchymal cell migration (Vuoriluoto et al., 2011). Reports have provided verification indicating that up-regulation of Vimentin is associated with PTC cell invasion (Lv et al., 2016). Another marker associated with EMT, N-cadherin, a mesenchymal cadherin, is overexpressed in several kinds of cancers (Tanaka et al., 2010). N-cadherin is also activated in PTC, and N-cadherin inhibition has been shown to reduce thyroid cancer cells by regulating several signaling pathways and repressing the EMT progression (Da et al., 2017). Besides, down-regulated E-cadherin expression can enhance metastasis (Ma et al., 2010). It has been reported that the activated E-cadherin can suppress human PTC cell migration and invasion (Cho et al., 2013). Bax, a gene related to apoptosis, has been reported to be capable of inducing apoptosis (Czabotar et al., 2013), while numerous studies have highlighted Bcl-2 as an inhibitor of apoptosis (Skommer et al., 2010). A previous study investigated SDC4 knockdown and concluded that it inhibits cell migration and invasion by suppressing Vimentin and inducing E-cadherin (Toba-Ichihashi et al., 2016). Echtermeyer et al. (2011) in addition demonstrated that SDC4 inhibits apoptosis, suggesting that SDC4 down-regulation promotes apoptosis. In addition, the inactivation of the Wnt/β-catenin signaling pathway plays a vital role in inhibiting invasion and migration in gastric cancer (Liu et al., 2018). Previous reports have indicated that inhibition of the Wnt/β-catenin signaling pathway also suppresses cell proliferation and enhances apoptosis (Bai et al., 2017), which was consistent with the results of our study. 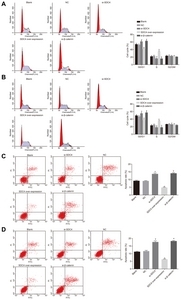 The results of our rescue experiments demonstrated that silencing SDC4 could inhibit the expression of the Wnt/β-catenin signaling pathway related proteins to inactivate the Wnt/β-catenin pathway and further inhibit EMT, which was largely conducive in preventing PTC cell migration and invasion. In conclusion, the key findings of the present study provided evidence demonstrating that SDC4 gene silencing affects cell EMT and apoptosis of PTC through the Wnt/β-catenin signaling pathway. Therefore, the identification of SDC4 gene silencing inhibiting the Wnt/β-catenin signaling pathway in PTC may aid in facilitating a better understanding of the potential molecular mechanisms, which could help discover novel biomarkers for the treatment of PTC in the future. Further studies are required, in order to fully elucidate the specific mechanisms associated with SDC4 regulating the Wnt/β-catenin signaling pathway in PTC. Fig. 1. (A) The 3 common genes PROS1, SDC4, and LRRK2 are found in the first 30 differentially expressed genes of profiles GSE66783, GSE3467, and GSE33630. 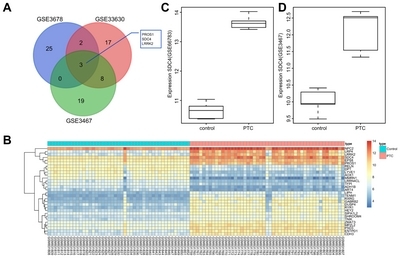 (B) Heat maps of the first 30 differentially expressed genes of profile GSE33630 where SDC4 expression level is higher in PTC tissues than that in the adjacent normal tissues. (C) Expression of SDC4 in PTC chip GSE66783; (D) Expression of SDC4 in PTC chip GSE3467. SDC4, Syndecan 4; PTC, papillary thyroid carcinoma; PROS1, protein S; LRRK2, Leucine-rich repeat kinase 2. Fig. 2. (A) Immunohistochemical staining for the positive expression of SDC4 in PTC, adjacent normal and negative PTC tissues (× 400). (B) Positive rate of SDC4 expression is higher in PTC tissues than that in adjacent normal tissues. SDC4, Syndecan 4; PTC, papillary thyroid carcinoma; *p < 0.05, vs. adjacent normal tissues; the experimental data were measurement data; the chi-square test was used to analyze data; n = 80; the experiment was repeated 3 times. Fig. 3. (A) mRNA levels of SDC4, Wnt3a, β-catenin, Bcl-2, Bax, E-cadherin, Vimentin, and N-cadherin determined by RT-Qpcr. (B) Protein levels of SDC4, Wnt3a, β-catenin, Bcl-2, Bax, E-cadherin, Vimentin, and N-cadherin determined by western blot analysis. (C) Protein bands of SDC4, Wnt3a, β-catenin, Bcl-2, Bax, E-cadherin, Vimentin, N-cadherin and GAPDH; RT-qPCR, reverse transcription quantitative polymerase chain reaction. SDC4, Syndecan 4; PTC, papillary thyroid carcinoma; EMT, epithelial mesenchymal transition; Bcl-2, B-cell lymphoma-2; Bax, Bcl-2-Associated X; GAPDH, glyceraldehyde-3-phosphate dehydrogenase; *p < 0.05, vs. adjacent normal tissues; the experimental data were measurement data; the t-test was performed for comparison between two groups of each biomarker; n = 80; the experiment was repeated 3 times. Fig. 4. (A) mRNA levels of SDC4 in each cell line; *p < 0.05, vs. normal thyroid cells; #p < 0.05, vs. BCPAP and IHH-4 cell lines; the experimental data were measurement data; the one-way ANOVA was used to analyze data; the experiment was repeated 3 times. (B) mRNA levels of SDC4, Wnt3a, β-catenin, Bcl-2, Bax, E-cadherin, Vimentin, and N-cadherin and Axin2 in K1 and TPC-1 cell lines detected by RT-qPCR; RT-qPCR, reverse transcription quantitative polymerase chain reaction; SDC4, Syndecan 4; PTC, papillary thyroid carcinoma; EMT, epithelial mesenchymal transition; NC, negative control; Bcl-2, B-cell lymphoma-2; Bax, Bcl-2-Associated X; ANOVA, analysis of variance; *p < 0.05, vs. the blank group; #p < 0.05, vs. the si-SDC4 group; the experimental data were measurement data; the one-way ANOVA was used to analyze data; the experiment was repeated 3 times. Fig. 5. (A) Protein bands of SDC4, Wnt3a, β-catenin, Bcl-2, Bax, E-cadherin, Vimentin, N-cadherin and GAPDH in K1 and TPC-1 cell lines. (B) Protein levels of SDC4, Wnt3a, β-catenin, Bcl-2, Bax, E-cadherin, Vimentin, and N-cadherin in K1 cell line. (C) Protein levels of SDC4, Wnt3a, β-catenin, Bcl-2, Bax, E-cadherin, Vimentin, and N-cadherin in TPC-1 cell line; SDC4, Syndecan 4; PTC, papillary thyroid carcinoma; Bcl-2, B-cell lymphoma 2; Bax, Bcl-2-Associated X; GAPDH, glyceraldehyde-3-phosphate dehydrogenase; EMT, epithelial mesenchymal transition; NC, negative control; ANOVA, analysis of variance; *p < 0.05, vs. the blank group; #p < 0.05, vs. the si-SDC4 group; the experimental data were measurement data; the one-way ANOVA was used to analyze data; the experiment was repeated 3 times. Fig. 6. (A) The percentage of PI-stained cells at the G0/G1, S, and G2/M phases in K1 cell line. (B) The percentage of PI-stained cells at the G0/G1, S, and G2/M phases in TPC-1 cell line. (C) Cell apoptosis rate in K1 cell line. (D) Cell apoptosis rate in TPC-1 cell line; SDC4, Syndecan 4; PTC, papillary thyroid carcinoma; PI, propidium podide; NC, negative control; ANOVA, analysis of variance; *p < 0.05, vs. the blank group; #p < 0.05, vs. the si-SDC4 group; the experimental data were measurement data; the histograms were plotted based on the analyses by the one-way ANOVA; the experiment was repeated 3 times. Fig. 7. (A) Cell invasion in K1 and TPC-1 cell lines using scratch test. (B) Cell migration in K1 and TPC-1 cell lines using Transwell assay. (C) The number of invasion cells in K1 and TPC-1 cell lines. (D) Cell migration distance in K1 and TPC-1 cell lines (× 200); SDC4, Syndecan 4; PTC, papillary thyroid carcinoma; NC, negative control; ANOVA, analysis of variance; *p < 0.05, vs. the blank group; #p < 0.05, vs. the si-SDC4 group; the experimental data were measurement data; the two-way ANOVA was used to analyze data; the experiment was repeated 3 times. Fig. 8. (A) Results of Transwell assay in K1 cells. (B) Results of scratch test at 0 h and 24 h in K1 cells. (C) Western blot analysis was used to determine the protein levels of the Wnt/β-catenin signaling pathway and EMT related factors (× 200); SDC4, Syndecan 4; NC, negative control; EMT, epithelial mesenchymal transition; *p < 0.05, vs. the si-SDC4 + NC group; #p < 0.05, vs. the SDC4 over-expression + si-NC group; the experimental data were measurement data; the independent t-test was used to analyze data; the experiment was repeated 3 times. Note: RT-qPCR, reverse transcription quantitative polymerase chain reaction; SDC4, Syndecan 4; Bcl-2, B-cell lymphoma-2; Bax, Bcl-2-Associated X; Axin2, axis inhibition protein 2. Note: SDC4, Syndecan 4; TNM, tumor-node-metastasis; the experimental data were measurement data; the chi-square test was used to analyze data; n = 80. Astudillo, P., and Larrain, J. (2014). Wnt signaling and cell-matrix adhesion. Curr Mol Med. 14, 209-220. Astudillo, P., Carrasco, H., and Larrain, J. (2014). Syndecan-4 inhibits Wnt/β-catenin signaling through regulation of low-density-lipoprotein receptor-related protein (LRP6) and R-spondin 3. Int J Biochem Cell Biol. 46, 103-112. Bai, D., Sun, H., Wang, X., Lou, H., Zhang, J., Wang, X., and Jiang, L. (2017). MiR-150 Inhibits cell growth in vitro and in vivo by restraining the RAB11A/WNT/β-catenin pathway in thyroid cancer. Med Sci Monit. 23, 4885-4894. Brown, R.L., de Souza, J.A., and Cohen, E.E. (2011). Thyroid cancer: burden of illness and management of disease. J Cancer. 2, 193-199. Cancer Genome Atlas Research Network (2014). Integrated genomic characterization of papillary thyroid carcinoma. Cell. 159, 676-690. Cho, I.R., Koh, S.S., Min, H.J., Kim, S.J., Lee, Y., Park, E.H., Ratakorn, S., Jhun, B.H., Oh, S., and Johnston, R.N. (2011). Pancreatic adenocarcinoma up-regulated factor (PAUF) enhances the expression of β-catenin, leading to a rapid proliferation of pancreatic cells. Exp Mol Med. 43, 82-90. Cho, S.W., Lee, E.J., Kim, H., Kim, S.H., Ahn, H.Y., Kim, Y.A., Yi, K.H., Park, D.J., Shin, C.S., and Ahn, S.H. (2013). Dickkopf-1 inhibits thyroid cancer cell survival and migration through regulation of β-catenin/E-cadherin signaling. Mol Cell Endocrinol. 366, 90-98. Chung, K.W., Kim, S.W., and Kim, S.W. (2012). Gene expression profiling of papillary thyroid carcinomas in Korean patients by oligonucleotide microarrays. J Korean Surg Soc. 82, 271-280. Czabotar, P.E., Westphal, D., Dewson, G., Ma, S., Hockings, C., Fairlie, W.D., Lee, E.F., Yao, S., Robin, A.Y., and Smith, B.J. (2013). Bax crystal structures reveal how BH3 domains activate Bax and nucleate its oligomerization to induce apoptosis. Cell. 152, 519-531. Da, C., Wu, K., Yue, C., Bai, P., Wang, R., Wang, G., Zhao, M., Lv, Y., and Hou, P. (2017). N-cadherin promotes thyroid tumorigenesis through modulating major signaling pathways. Oncotarget. 8, 8131-8142. Echtermeyer, F., Harendza, T., Hubrich, S., Lorenz, A., Herzog, C., Mueller, M., Schmitz, M., Grund, A., Larmann, J., and Stypmann, J. (2011). Syndecan-4 signalling inhibits apoptosis and controls NFAT activity during myocardial damage and remodelling. Cardiovasc Res. 92, 123-131. Erdem, M., Erdem, S., Sanli, O., Sak, H., Kilicaslan, I., Sahin, F., and Telci, D. (2014). Up-regulation of TGM2 with ITGB1 and SDC4 is important in the development and metastasis of renal cell carcinoma. Urol Oncol. 32, 25 e13-20. Francis, G.L., Waguespack, S.G., Bauer, A.J., Angelos, P., Benvenga, S., Cerutti, J.M., Dinauer, C.A., Hamilton, J., Hay, I.D., and Luster, M. (2015). Management Guidelines for Children with Thyroid Nodules and Differentiated Thyroid Cancer. Thyroid. 25, 716-759. Fujita, A., Sato, J.R., de Rodrigues, L.O., Ferreira, C.E., and Sogayar, M.C. (2006). Evaluating different methods of microarray data normalization. BMC bioinformatics. 7, 469. Gilbert-Sirieix, M., Makoukji, J., Kimura, S., Talbot, M., Caillou, B., Massaad, C., and Massaad-Massade, L. (2011). Wnt/β-catenin signaling pathway is a direct enhancer of thyroid transcription factor-1 in human papillary thyroid carcinoma cells. PloS one. 6, e22280. Hellmann, F., Verdi, M., Schlemper, B.R., and Caponi, S. (2014). 50th anniversary of the declaration of Helsinki: the double standard was introduced. Arch Med Res. 45, 600-601. Huang, J., Xiao, D., Li, G., Ma, J., Chen, P., Yuan, W., Hou, F., Ge, J., Zhong, M., and Tang, Y. (2014). EphA2 promotes epithelial-mesenchymal transition through the Wnt/β-catenin pathway in gastric cancer cells. Oncogene. 33, 2737-2747. Jung, C.K., Little, M.P., Lubin, J.H., Brenner, A.V., Wells, S.A., Sigurdson, A.J., and Nikiforov, Y.E. (2014). The increase in thyroid cancer incidence during the last four decades is accompanied by a high frequency of BRAF mutations and a sharp increase in RAS mutations. J Clin Endocrinol Metab. 99, E276-285. Lee, M.A., Park, J.H., Rhyu, S.Y., Oh, S.T., Kang, W.K., and Kim, H.N. (2014). Wnt3a expression is associated with MMP-9 expression in primary tumor and metastatic site in recurrent or stage IV colorectal cancer. BMC Cancer. 14, 125. Lendorf, M.E., Manon-Jensen, T., Kronqvist, P., Multhaupt, H.A., and Couchman, J.R. (2011). Syndecan-1 and syndecan-4 are independent indicators in breast carcinoma. J Histochem Cytochem. 59, 615-629. Li, X., Abdel-Mageed, A.B., and Kandil, E. (2012). BRAF mutation in papillary thyroid carcinoma. Int J Clin Exp Med. 5, 310-315. Liu, W., Chen, Y., Xie, H., Guo, Y., Ren, D., Li, Y., Jing, X., Li, D., Wang, X., and Zhao, M. (2018). TIPE1 suppresses invasion and migration through down-regulating Wnt/β-catenin pathway in gastric cancer. J Cell Mol Med. 22, 1103-1117. Looyenga, B.D., Furge, K.A., Dykema, K.J., Koeman, J., Swiatek, P.J., Giordano, T.J., West, A.B., Resau, J.H., Teh, B.T., and MacKeigan, J.P. (2011). Chromosomal amplification of leucine-rich repeat kinase-2 (LRRK2) is required for oncogenic MET signaling in papillary renal and thyroid carcinomas. Proc Natl Acad Sci USA. 108, 1439-1444. Lu, T., Bao, Z., Wang, Y., Yang, L., Lu, B., Yan, K., Wang, S., Wei, H., Zhang, Z., and Cui, G. (2016). Karyopherinβ1 regulates proliferation of human glioma cells via Wnt/β-catenin pathway. Biochem Biophys Res Commun. 478, 1189-1197. Lv, N., Shan, Z., Gao, Y., Guan, H., Fan, C., Wang, H., and Teng, W. (2016). Twist1 regulates the epithelial-mesenchymal transition via the NF-kappaB pathway in papillary thyroid carcinoma. Endocrine. 51, 469-477. Ma, L., Young, J., Prabhala, H., Pan, E., Mestdagh, P., Muth, D., Teruya-Feldstein, J., Reinhardt, F., Onder, T.T., and Valastyan, S. (2010). miR-9, a MYC/MYCN-activated microRNA, regulates E-cadherin and cancer metastasis. Nat Cell Biol. 12, 247-256. Nikolova, V., Koo, C.Y., Ibrahim, S.A., Wang, Z., Spillmann, D., Dreier, R., Kelsch, R., Fischgrabe, J., Smollich, M., and Rossi, L.H. (2009). Differential roles for membrane-bound and soluble syndecan-1 (CD138) in breast cancer progression. Carcinogenesis. 30, 397-407. Ohkawara, B., Glinka, A., and Niehrs, C. (2011). Rspo3 binds syndecan 4 and induces Wnt/PCP signaling via clathrin-mediated endocytosis to promote morphogenesis. Dev Cell. 20, 303-314. Ohori, N.P., Wolfe, J., Carty, S.E., Yip, L., LeBeau, S.O., Berg, A.N., Schoedel, K.E., Nikiforov, Y.E., and Seethala, R.R. (2017). The influence of the noninvasive follicular thyroid neoplasm with papillary-like nuclear features (NIFTP) resection diagnosis on the false-positive thyroid cytology rate relates to quality assurance thresholds and the application of NIFTP criteria. Cancer Cytopathol. 125, 692-700. Okolicsanyi, R.K., Buffiere, A., Jacinto, J.M., Chacon-Cortes, D., Chambers, S.K., Youl, P.H., Haupt, L.M., and Griffiths, L.R. (2015). Association of heparan sulfate proteoglycans SDC1 and SDC4 polymorphisms with breast cancer in an Australian Caucasian population. Tumour Biol. 36, 1731-1738. Sheu, S.Y., Grabellus, F., Schwertheim, S., Worm, K., Broecker-Preuss, M., and Schmid, K.W. (2010). Differential miRNA expression profiles in variants of papillary thyroid carcinoma and encapsulated follicular thyroid tumours. Br J Cancer. 102, 376-382. Skommer, J., Brittain, T., and Raychaudhuri, S. (2010). Bcl-2 inhibits apoptosis by increasing the time-to-death and intrinsic cell-to-cell variations in the mitochondrial pathway of cell death. Apoptosis. 15, 1223-1233. Smyth, G.K. (2004). Linear models and empirical bayes methods for assessing differential expression in microarray experiments. Stat Appl Genet Mol Biol. 3. Tanaka, H., Kono, E., Tran, C.P., Miyazaki, H., Yamashiro, J., Shimomura, T., Fazli, L., Wada, R., Huang, J., and Vessella, R.L. (2010). Monoclonal antibody targeting of N-cadherin inhibits prostate cancer growth, metastasis and castration resistance. Nat Med. 16, 1414-1420. Toba-Ichihashi, Y., Yamaoka, T., Ohmori, T., and Ohba, M. (2016). Up-regulation of Syndecan-4 contributes to TGF-β1-induced epithelial to mesenchymal transition in lung adenocarcinoma A549 cells. Biochem Biophys Rep. 5, 1-7. Vuoriluoto, K., Haugen, H., Kiviluoto, S., Mpindi, J.P., Nevo, J., Gjerdrum, C., Tiron, C., Lorens, J.B., and Ivaska, J. (2011). Vimentin regulates EMT induction by Slug and oncogenic H-Ras and migration by governing Axl expression in breast cancer. Oncogene. 30, 1436-1448. Wang, X., Lu, X., Geng, Z., Yang, G., and Shi, Y. (2017). LncRNA PTCSC3/miR-574-5p governs cell proliferation and migration of papillary thyroid carcinoma via Wnt/β-catenin signaling. J Cell Biochem. 118, 4745-4752. Xing, M., Alzahrani, A.S., Carson, K.A., Viola, D., Elisei, R., Bendlova, B., Yip, L., Mian, C., Vianello, F., and Tuttle, R.M. (2013). Association between BRAF V600E mutation and mortality in patients with papillary thyroid cancer. JAMA. 309, 1493-1501. Xu, B., and Ghossein, R. (2018). Evolution of the histologic classification of thyroid neoplasms and its impact on clinical management. Eur J Surg Oncol. 44, 338-347. Yao, H., Ashihara, E., and Maekawa, T. (2011). Targeting the Wnt/β-catenin signaling pathway in human cancers. Expert Opin Ther Targets. 15, 873-887. Zhang, J., Gill, A.J., Issacs, J.D., Atmore, B., Johns, A., Delbridge, L.W., Lai, R., and McMullen, T.P. (2012). The Wnt/β-catenin pathway drives increased cyclin D1 levels in lymph node metastasis in papillary thyroid cancer. Hum Pathol. 43, 1044-1050. Zhang, X., Li, M., Zuo, K., Li, D., Ye, M., Ding, L., Cai, H., Fu, D., Fan, Y., and Lv, Z. (2013). Upregulated miR-155 in papillary thyroid carcinoma promotes tumor growth by targeting APC and activating Wnt/β-catenin signaling. J Clin Endocrinol Metabol. 98, E1305-1313. Zhong, H., De Marzo, A.M., Laughner, E., Lim, M., Hilton, D.A., Zagzag, D., Buechler, P., Isaacs, W.B., Semenza, G.L., and Simons, J.W. (1999). Overexpression of hypoxia-inducible factor 1alpha in common human cancers and their metastases. Cancer Res. 59, 5830-5835.